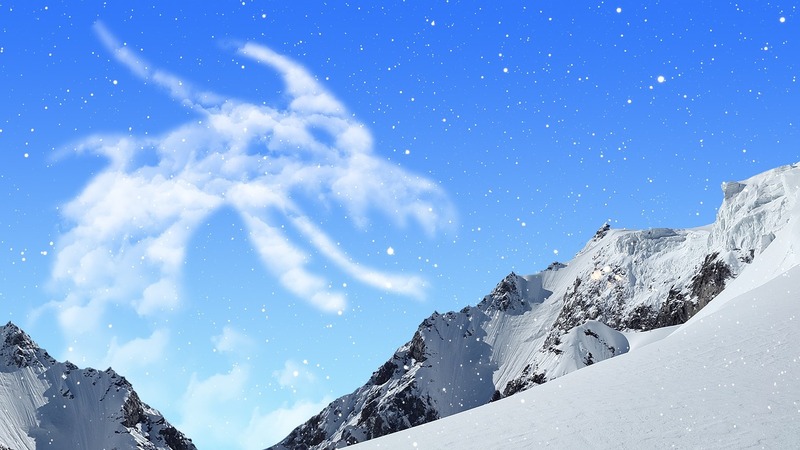 Since ancient times, the dragon was an important creature and symbol associated with the Norse mythology and, later on, integrated and described in the folk tales of the Scandinavian countries. So it is that dragons were mentioned and depicted in various legends, sagas, chronicles, and skaldic poems during the High Middle Ages in both Iceland and Denmark. Such prominent literary works from the period in question which detail the role ascribed for dragons in the Norse mythology include Völuspá (one of the earliest and most well known poems written in Old Norse), the Völsung cycle (a series of renowned Norse legends recorded under literary form in medieval Iceland and as rock carvings in present day Norway, Sweden, and England) or Gesta Danorum (a 12th century chronicle authored by Saxo Grammaticus which recounts the history of the Danes). By far, the most well known Norse dragons accounted in the aforementioned sources are Níðhǫggr (or Nidhogg in English and modern Norwegian), Jǫrmungandr (commonly known as the Midgard Serpent), Fáfnir (the mythical dragon slain by Sigurd), and a certain dragon killed by Frotho I, a legendary King of the Danes portrayed in Gesta Danorum. Níðhǫggr (literally ‘malice striker’ in English, as the Old Nose term ‘níð’ meant loss of honour in the Norse society and ‘höggr’ striker respectively) appears in the Old Norse texts as an atrocious creature which gnaws the roots of the world tree, namely Yggdrasil. Consequently, it was named as such given its appearance and its terrifying behaviour towards the dishonest dwellers of Hel (the realm of the dishonorable dead in Norse cosmology). 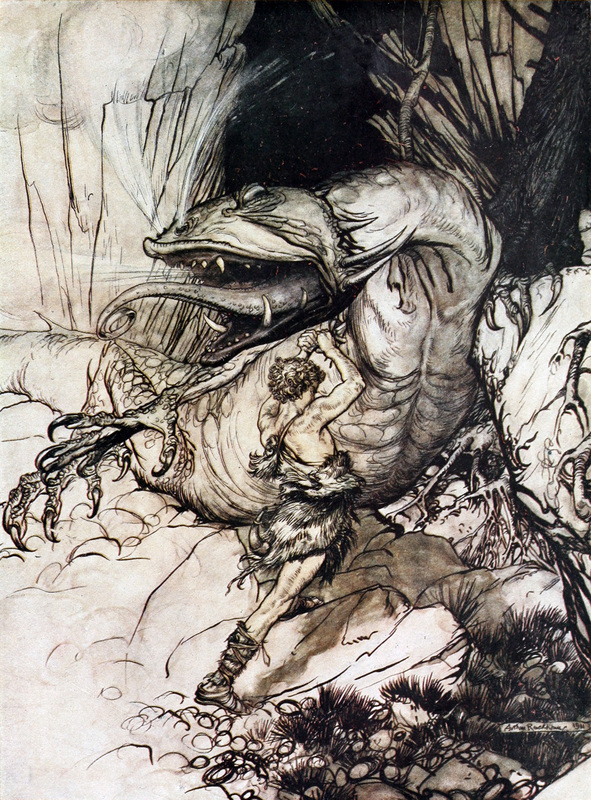 Jǫrmungandr (literally ‘great beast’), one of the offsprings of giantess Angrboða (Angrbroda) and trickster god Loki, is the humongous sea serpent which dwells in the ocean that encircles Midgard (the realm of humankind in Norse cosmology). Its nemesis is represented by Thor, the god of lightnings and thunders, protector of mankind. Fáfnir, initially the son of King Hreiðmarr (Hreidmar) of the dwarves, is said to have been cursed at some point by a magical ring crafted by a magician dwarf by the name Andvari which turned him into a dragon. Subsequently, he will be slain by Sigurd, a legendary Norse hero. Interestingly enough, he might have been the basis for the fantasy dragon Smaug from J.R.R. Tolkien’s first high fantasy novel ‘The Hobbit’ published in 1937, which further explains the so-called ‘dragon sickness’ for gold. As a matter of fact, much of the information on the dwarves stemming from the Norse mythology was adapted into Tolkien’s work, particularly in ‘The Hobbit’, where some dwarves themselves present many characteristics to the noble ones who are to be found in Völsunga saga or the Prose Edda of Snorri Sturluson. 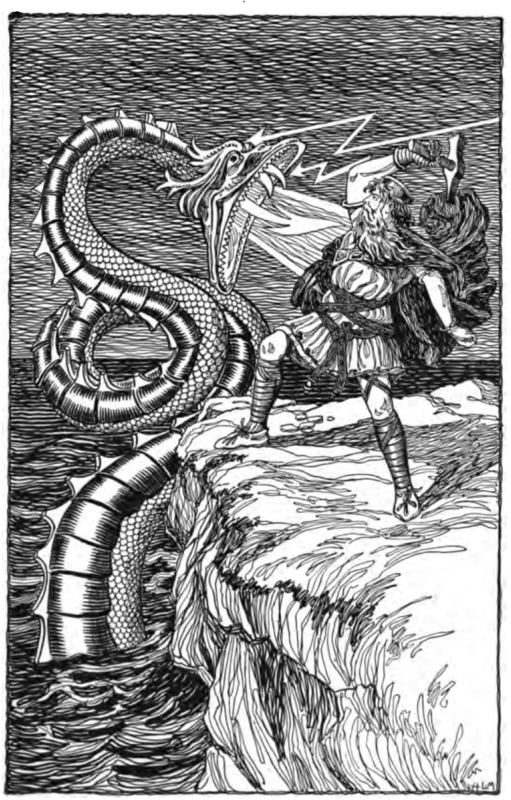 Last but not least, similarly to the case of Fáfnir and his gold treasure, the legendary Danish king Frode I (Frotho I in English) is accounted in Saxo Grammaticus’ 12th century Gesta Danorum (literally ‘The Deeds of the Danes’) as travelling at some point to an island where a dragon lived in a cave of a mountain, guarding abundant riches of an immense hoard. To defend against its poison, Frotho needed to equip himself prior to the clash with a special cowhides shield. Just as with the dwarves, Frotho might have also inspired Tolkien in creating the hobbit Frodo (although this could be a mere coincidence with respect to their names). 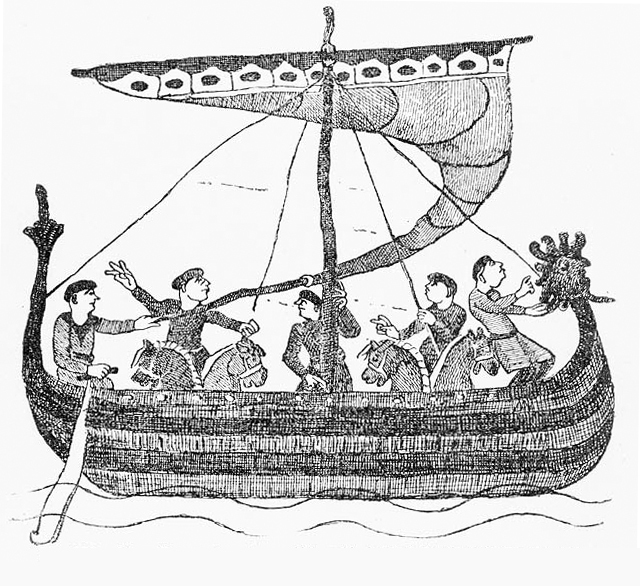 Regarding the real usage of the dragon in the Norse culture, it must be mentioned that the most wealthiest of the reputed longships were decorated with dragon heads on their bow and stern, as a sign of strength, power, and bravery. In addition, waving draco flags were sometimes on the battlefield by the Norsemen (and also by the Anglo-Saxons) in order to intimidate their foes. Thus, the dragon was definitely a major symbol that defined the Viking Age. I have seen that dragon about to eat a viking long boat with a bunch of Vikings fighting it throwing axes and shooting arrows at it with a giant sorceress behind it an a giant knight helping the little Vikings on the boat fight them in a cloud.